Investors believe the economy will eventually rebound, but they are unsure how much further it will slide. Investors sent Washington a message this week: They won't commit to stocks until the government commits to a plan. Stocks ended lower Friday, pushing the Dow Jones industrial average to its lowest close since last November and leaving it with a weekly decline of more than 4 percent. The gears are moving in Washington. On Friday, the White House said President Obama will outline steps to stem home foreclosures next Wednesday, and the House passed a $787 billion economic stimulus bill. Wall Street is focused, though, on the lingering uncertainties. The stimulus package — too big for some, too small for others — is far from proving itself effective in reviving the economy. Investors also hesitated to get too excited about the upcoming announcement on preventing home foreclosures, after their hopes got dashed earlier in the week. The bulk of the market's decline this week came Tuesday, when U.S. Treasury Secretary Timothy Geithner said he would assess banks' financial health and remove their toxic assets with the help of the private sector — but provided few details about how the process would work. "Until we get this clarity, I think it's just stop and go. I don't think we collapse from here, but I don't think we go much higher," said Peter Cardillo, chief market economist at the brokerage house Avalon Partners Inc. It's possible some clues will emerge from the meeting of Group of Seven finance ministers. Officials from leading industrial nations are discussing new financial markets rules, concerns about protectionist measures in stimulus plans, and the effect of the financial crisis on poorer countries. But few analysts anticipate major breakthroughs in the group's report Saturday. A spate of gut-wrenching economic and corporate earnings reports over the past few weeks have also left the market deeply unsettled. On Friday, the University of Michigan delivered the latest dose of gloomy news, reporting that consumer sentiment dropped sharply in February. The economy should rebound eventually, but economists are unsure how much further it will slide in the meantime — and fund managers don't know yet which companies will come out on top. With stock prices so low, "you're certainly rewarded for risk-taking. Unfortunately, it's not a great environment to take a lot of risk," said Jack A. Ablin, chief investment officer at Harris Private Bank. "It's a game of chicken, and most of us are chickens." According to preliminary calculations, the Dow fell 82.35, or 1.04 percent, to 7,850.41. It was the lowest close since Nov. 20, when the blue-chip index settled at a five-and-a-half month low of 7,552.29. Broader stock indicators also fell. The Standard & Poor's 500 index lost 8.35, or 1.00 percent, to 826.84, and the Nasdaq composite index decreased 7.35, or 0.48 percent, to 1,534.36. 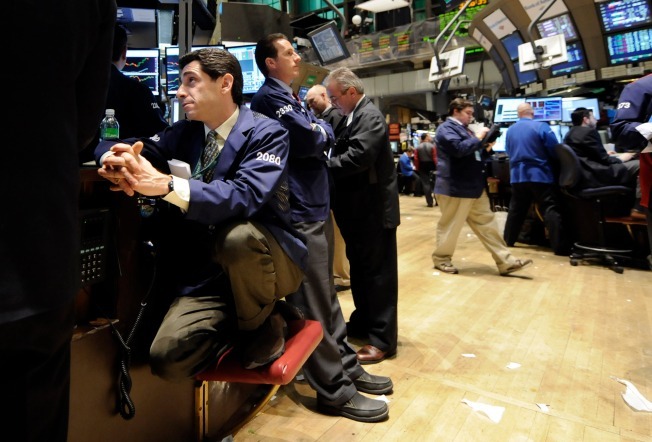 The Russell 2000 index of smaller companies fell 2.06, or 0.46 percent, to 448.36.